The Michael C. Carlos Museum of Art, one of Atlanta's best kept secrets, is a an estate for wonderment as well as learning. 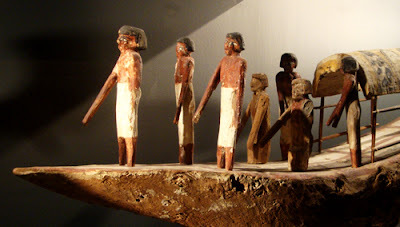 Just researching this wooden model boat (photo), I learned that after the First Intermediate Period of Egypt's history, decorating the interior walls of tombs was replaced by adding models "depicting the activities of daily life needed to sustain the deceased." Coming later this year to the Carlos Museum, as it's sometimes called, is a rare opportunity to see the oldest Egyptian mummy in the Western hemisphere, and it'll be on display for a mere three months. "Life and Death in the Pyramid Age: The Emory Old Kingdom Mummy" opens Saturday, September 10, 2011 and will run through Sunday, December 11, 2011.